Eco-Friendly & Made in the USA! 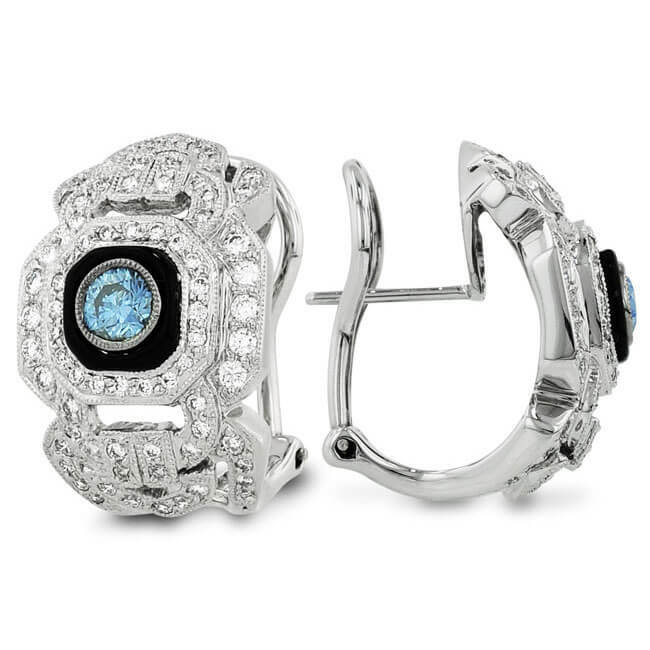 In South Beach or in the South of France, Be Breathtaking in these Art Deco Design Leverback earrings featuring 0.26 Ct Round Vivid Blue Created Diamond Centers with contrasting Onyx and Diamond Accent Stones. The earrings are set in 18kt white gold. Matching ring is also available. Each item is accompanied by a grading report and a certificate of Eco-Friendly Origin. The diamonds that you are purchasing were created by Renaissance here in the USA in partnership with Scio (SCIO) Diamond. Lab Grown or Lab Created Diamonds are chemically, physically, and optically identical to the properties of mined diamonds. The only difference between Lab-Grown and earth-mined diamonds is their point of origin. Guaranteed origin, full disclosure, and commitment to transparency, assure that Lab Grown Diamonds are conflict-free. Renaissance grows diamonds in a technologically advanced facility here in the USA using modest amounts of energy, and having very little direct impact on the environment. Lab Grown diamonds do not undermine the sustainability of natural systems or our environment, allowing future generations to have the natural resources they need. Free FedEx Shipping All orders within the Continental United States are Shipped Free by FedEx Standard Overnight (delivery usually by 4:30 PM). International Orders Ship via FedEx International Priority; however you will be responsible for any additional shipping charges, customs, duties, V.A.T. (value-added taxes) and any other charges other than the $75.00 FedEx International Priority Shipping. Renaissance Satisfaction Guarantee: You have 30-Days To Love Your Purchase or Return it! When you receive your Renaissance Created Diamond or Jewelry item, you'll have 30-days to examine it, compare it and if you’re not 100% satisfied with your Renaissance Diamond or Jewelry, send it back at no cost to you! Terms and conditions apply. We stand behind our products and warrant that our loose diamonds and jewelry will be free from manufacturing defects for the life of the products. If you believe your item has a manufacturing defect, you may return it to us for inspection. If we determine your merchandise is damaged due to a manufacturing defect, we will repair the merchandise or, if we determine appropriate, replace the item. If the item is no longer available, Renaissance may at its discretion, replace with like-kind or allow a refund equal to the selling price of the original item or component. Please note that slight irregularities and variations in craftsmanship or natural characteristics, or internal inclusions, visible or otherwise, in colored gemstones are unique and individual to each item. These characteristics are considered as part of the character of the item, and should not be considered a defect. If we determine that the damage is not caused by a manufacturing defect, then we will notify you and let you know if repair services are available at cost or for a fee. This warranty does not extend beyond the purchase price of the item. We expressly disclaim liability for consequential damages and for breach of any expressed or implied warranty including merchantability or fitness for any purpose. We are the original source that sells only what are referred to as lab grown diamonds, man-made diamonds, created diamonds, cultured diamonds, and including synthetic diamonds. Renaissance Diamonds are certified by International Gemological Institute (IGI) as a real diamond. Do not confuse our diamonds with fakes like DiamondNexus, or Moissanite, those are not diamonds. We are the Manufacturer, Not A Middle-Man or Reseller... and with our A+ BBB Rating... We're Your Trusted Source. These are not Fake or Synthetic Diamonds! Each is A Certified Diamond that Is Chemically, Optically & Physically Identical to a Mined Diamond. 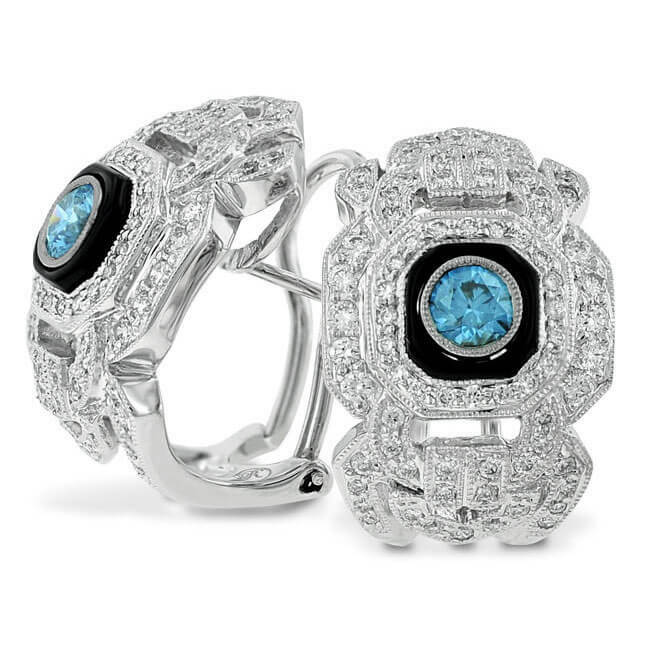 Renaissance Created Diamonds was founded in 1995 when escalating prices and supply shortages of fine diamonds and precious gemstones created the need to seek out and develop lab grown alternatives. Our lab grown diamonds are certified to be of the highest quality, Eco-friendly and sustainablly produced. The innovative approach considers both the consumers needs and our planet's resources to produce one-of-a-kind colorless and fancy colored diamonds. Want to know more about Renaissance? Contact Us! We are manufacturers of lab created diamonds. We're not resellers or online retailers. We sell our certified diamonds directly to you saving you, thousands of dollars. Copyright 1996-2017 Renaissance Diamonds Inc.